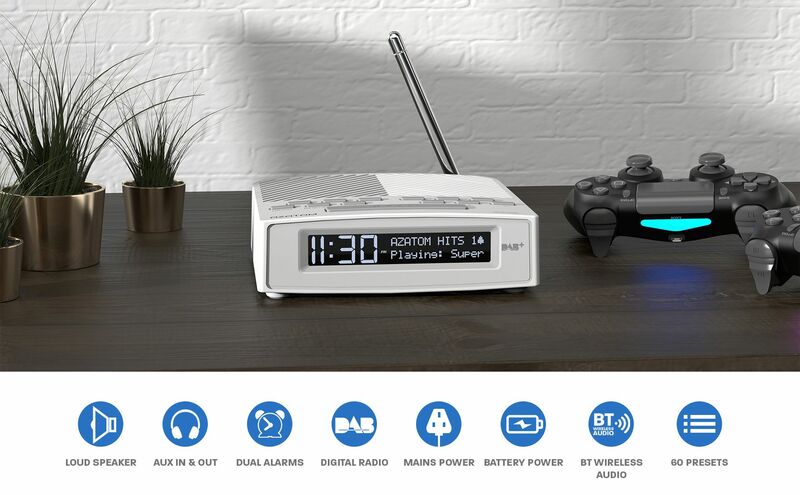 The Horizon is the perfect bedside radio alarm clock. It has DAB+, DAB, FM, Bluetooth and a host of other useful features. It is ‘Future Ready’ and has been accredited with the Digital Tick. When you choose the Horizon you will love the combination of features and the sleek, modern design will ensure it becomes your perfect companion. The Digital Radio Certification Mark (“tick mark”) identifies and gives you greater assurance you are buying a product which has been independently tested and certified as reaching the highest levels of performance in important areas such as the reliability of reception, tuning and all other digital radio features. It also informs you that you are purchasing a radio which has been designed from the ground up to work in the future. As a premium British brand we are very proud to have been awarded the Digital Radio tick mark and to be able to deliver the very best products to our customers. The Horizon has a headphone output so you can listen to the radio without disturbing anyone else. An Aux-in lets you play music from your phone, tablet or MP3 Player. Whilst positioned neatly on the back of the Horizon is a quick charge USB out port which lets you fast-charge your phone or table whilst you sleep, Ideal for when you wake having a fully charged phone ready to go. "This DAB clock radio is the best!" 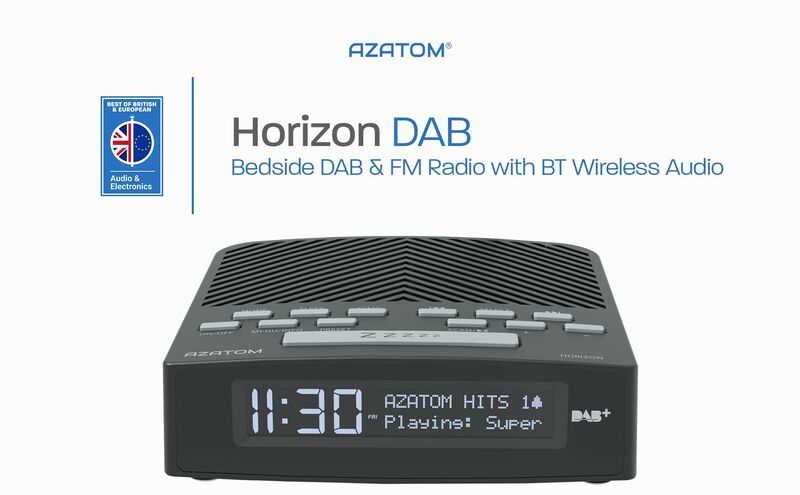 In the menu of your Horizon you can set the time and date manually or you can choose to have the time/date to automatically update from either FM, Dab or Both – each time the radio receives a signal from a compatible radio station it will automatically update the time and date information. We recommend using the Factory Reset to restore your device to its original settings. The factory reset is within the menu of the unit and resets all software settings back to the original factory settings. Put the Horizon into Bluetooth Mode using the Mode button. Once the speaker is in Bluetooth mode, start a search on your Bluetooth device. When the Horizon appears in your Bluetooth devices menu please select it and they will pair automatically. Can I use headphones with the Horizon? Yes the Horizon has a headphone output so you can listen to the radio without disturbing anyone else. Can I dim the display? Yes the Horizon’s display can be dimmed and brightened using the snooze/dimmer button. How do I store Presets on my Horizon? Long press the Preset button to enter “Preset Store”. Use the ‘forward’ and ‘back’ buttons to choose a number for the preset and press Select to store. How do I recall Presets on my Horizon? Short press the Preset button to enter “Preset Recall”. Use the ‘forward’ and ‘back’ buttons to choose which preset you would like and press Select to recall it. Does the Horizon have a sleep timer? Yes, the Sleep timer can be set for 90, 60, 45, 30 or 15 minutes. Can I charge my mobile device from the Horizon? Why is my Horizon not charging my connected device from the USB-Charge Out? Please ensure your Horizon is plugged into the mains for charging your mobile device.